& Canon BVP-3 13X Zoom Lens. Sony DXF-501 Viewfinder. Includes : Sony PVV-1A Recorder. Sony DXC-537. Sony Chiba Precision Co. Chiba Precision Co. Small orders are no problem. Joseph Fazzio, Inc. Surplus Division. AWG GPIB Programming Disk (1/1). Sony Tektronix ver 1.0 AWG 2000 Series 063-1708-00. 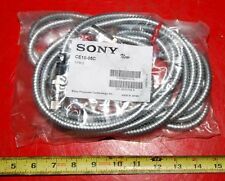 Sony CE10-05C DRO Cable NOS. Not What You Were Looking For?. 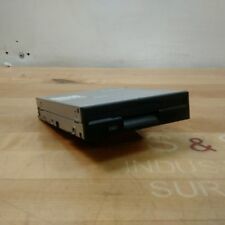 Used, untested but pulled from Point of Sale systems that probably saw little to no floppy drive usage. Sony SR-2711 19" Scale. These services include Item is sold as pictured. NO VERBAL CONFIRMATION WILL BE GIVEN, THIS MUST BE IN WRITING. Magnescale LY-201. Sony Digital Readout Display. Sony DRO Display LH10. Condition is Used. Shipped with USPS Parcel Select Ground. SONY DVD PLAYER CIRCUIT BOARD. Fuse 0.8 Amp. Weight 2.0 Oz. Phone Parts. Let us fix the problem for you. We will do our best to get back to you as soon as possible. - Local Pickup. We feel that finding the parts you need should not be a major task. We will work hard to fix any problems. Model: VMA239B NTSC / PAL. 120x optical zoom (10x zoom/12x digital). 1/3 type Super HAD CCD II. Video Motion Detection. Spot AE Response function. Internal/External sync. High Performance Digital Signal Processor (DSP). High-speed serial communication (max. ). WinXPE OS. Sony gives you options. The XCISX1 also includes an integrated 258MB SDRAM and extensive I/O connectivity via Ethernet, USB serial port and monitor out. External trigger input. Trigger delay function. High performance counter off a Lathe. Counter Lathe. cables and scales available taken from a Dong Yong engine (model LS) Lathe 20" x 60". Lathe function (Tool coordinating / Adding function). Program function. New Sony LT10-105B Display Unit 12-24 VDC. For Sale is a used SONY BKO-C1810-HO1 Positioning Module. WAREHOUSE: E-2. These services include NO VERBAL CONFIRMATION WILL BE GIVEN, THIS MUST BE IN WRITING. Item is sold as pictured. Model: 1-468-506-21 HS16S9U PR-990055 PF-LP. Fuse 125 VAC 2 Amp. Model: LY52 Series. Input: Sony unified interface (up/down). DZ51 adaptor required for Sony models with mini DIN connector (A/B to up/down). Manufacturer: Sony. 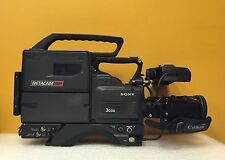 Sony models: DE-BR, DG-B, DL-B, SJ700, GB-A, SR series, Digiruler SL series (except 331). Display Compatiblity (LG10,LH51,LH52,LY51). Sony CH01-03C. ROSS Norgren Ingersoll Rand Bimba Wilkerson Pneumatic/Hydraulic Cylinders Browning Swagelok Thomson. We will do our best to describe each item to the best of our ability. Location: C-16. We are a surplus components dealer located in Blanchester OH. ROSS Norgren Ingersoll Rand Bimba Wilkerson Pneumatic/Hydraulic Cylinders Browning Swagelok Thomson. We will do our best to describe each item to the best of our ability. Location: S-155. We are a surplus components dealer located in Blanchester OH. (Inv.25068). with original instruction manuals. Not What You Were Looking For?. (1) PU20-11-2. Farmon ID 415560. Fastcom Faulhaber Federal Pioneer Federal Products Co. Futaba Futurestar Galil Motion GaSonics Gast GasTech Gaston Gates GC Valves GD California GE Fanuc GE General Electric GE Industrial Services Gems Sensors GEMU General Monitors General Precision General Scanning Genie Industries Genmark Automation GenRad Genwac Georg Fischer Geotest Gespac GF Signet Glassman Glentek Global Laser Gluton West Go Inc.Gould GPI General Precision GPI General Precision Inc.
SONY CD PLAYER SWITCH CIRCUIT BOARD. ROSS Norgren Ingersoll Rand Bimba Wilkerson Pneumatic/Hydraulic Cylinders Browning Swagelok Thomson. Sony X36758090. We are a surplus components dealer located in Blanchester OH. We have many new and used components for many different systems. (More Info: SCALES TYPE (2) SR128-105. Manufacturer: Sony. They do not allow us to look at your rates that you are getting with them. NOTE . 5) Like New Condition. ROSS Norgren Ingersoll Rand Bimba Wilkerson Pneumatic/Hydraulic Cylinders Browning Swagelok Thomson. We will do our best to describe each item to the best of our ability. Location: S-18. We are a surplus components dealer located in Blanchester OH. Electronic shutter 2 to 1/50,000 s (trigger mode), 2 to 1/100,000 s (free run mode). External trigger input pulse-edge detection mode/pulse-width detection mode. External trigger latency less than 10 us.